La serie di amplificatori più venduta al mondo è tornata con nuove caratteristiche, un nuovo look e tutta la flessibilità che ci si aspetta da un Fender Mustang. La nuova serie Mustang dispone di connettività USB e del software Fender FUSE, lasciando correre la tua creatività e la tua fantasia. Fender Mustang 1 v2 Amplificatore Chitarra. 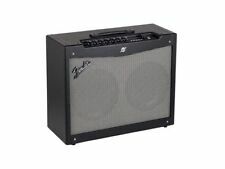 AMPLIFICATORE COMBO PER CHITARRA 2x12" 150W FENDER Mustang IV V2. La serie di amplificatori più venduta al mondo è tornata con nuove caratteristiche, un nuovo look e tutta la flessibilità che ci si aspetta da un Fender Mustang. Fender Mustang I (V.2) Combo 20W SPEDIZIONE GRATUITA!!! La nuova serie Mustang dispone di connettività USB e del software Fender FUSE, lasciando correre la tua creatività e la tua fantasia. FENDER Mustang IV V2. La serie di amplificatori più venduta al mondo è tornata con nuove caratteristiche, un nuovo look e tutta la flessibilità che ci si aspetta da un Fender Mustang. Die Marching-Abteilung bei music world hat es ebenfalls in sich. 1 x 8" Fender Special Lautsprecher. Fender FUSE Software. 17 Amp Models, inkl. den neuen '57 Twin und '60s Thrift Models. Eingebautes, chromatisches Stimmgerät. 12 Modulations-Effekte. 12 Modulationseffekte. Die neuen Verstärker der der Fender® Mustang™ Reihe setzen neue Maßstäbe in Sachen Vielseitigkeit und Power. Die verschiedenen Modelle strotzen nur so vor Authentizität und Effekten. Anche il reverbero è stato modificato per avere un suono ancora più caldo e dolce. Cover inclusa. Footswitch incluso. Loop effetti seriale. Uhren & Schmuck. Konsolen & Zubehör. Zubehör komplett: ja. 1 Kanal mit 24 Presets. Zustand: B-WARE. Bestückung: 1x 8" Special Fender Design Speaker. Fenster schließen. Größe: versione EUR. Die weltweit beliebteste Verstärker-Serie ist zurück – mit neuen Funktionen, einem neuen Design und all der Flexibilität, die Sie von einem Fender® Mustang gewohnt sind. Die neue Fender® Mustang V.2 Serie hebt die Standards für moderne und vielseitige Gitarrenmusik und umfasst fünf neue Verstärker-Modelle, fünf neue Effekte und smartes Pitchshifting. Ampli de puissance faible bruit. - logiciels (PC/MAC) : Fender FUSE, Ableton Live tite 8 Fender edition, AmpliTube® Fender® LE edition. - 1 haut-parleur de 8" Fender® Special Design. - Puissance : 20 Watts. Il nuovo amplificatore Fender® Mustang™ I v. 2 alza gli standard di versatilità di chitarra moderna e muscolo. Fender Mustang I v. 2 20W modellazione chitarra amplificatore Combo (nuovo). Fender Mustang I v. 2 20W modellazione chitarra amplificatore Combo caratteristiche principali. Es handelt sich um perfekt vernähte Kunstleder-Schutzbezügen in top Lederoptik.Ideal für Aufbewahrung oder Transport! Dies ist eine Schutzhülle passend für. Die Hülle ist wasserdicht, schützt vor Schlägen, schützt vor Staub zwischen. PERMUTIAMO IL TUO USATO ANCHE A DISTANZA! AMPLIFICATORE PER CHITARRA Lo standard per la versatilità e la potenza della chitarra moderna. Cono da 8” Fender Special Design. La serie di amplificatori più venduta al mondo è ci stupisce ancora:un nuovo design, un un nuovo look e tutta la flessibilità che ci si aspetta da un Fender® Mustang. La nuova serie Mustang presenta la connettività USB e il software Fender® FUSE. The standard for modern guitar versatility and muscle. Ted Brown Music has been serving the needs of musicians for over 80 years! SPECIAL ORDERS. Mustang I (V2) 120 Volt. Shape the on-board amp models ‘on the fly’ or dig deep and edit them with your computer using the included Fender FUSE software to further alter the included effects such as reverb, delay/echo, tremolo, phaser and many more. 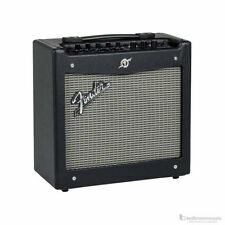 Please review the full item description of item "Fender Mustang 1 Version 2 Guitar Amplifier - 20w" for all information regarding delivery and technical specifications. 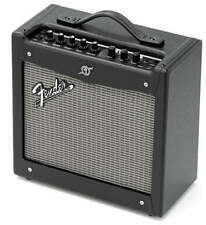 (Fender Mustang II V-2 Modeling Practice Amp: serial # CGPK15013091. Great little noise maker :-) can do pretty good copy of many classic sounds and has reverb/delay. 40 watts is plenty for practice. The new Fender® Mustang™ I V.2 amplifier raises the standard for modern guitar versatility and muscle. Mustang I includes USB connectivity for high-quality, low-latency audio output, and to engage the Fender® FUSE™ software application for PC and Mac. Speaker: 2x6.5 Fender Special Design. Power: 40W (2x20W stereo). We invent the world’s first WiFi-equipped guitar amplifier, making it easy for you to download the latest updates, access Fender artist-created presets, and connect directly with a community of other creative players and music makers like yourself. The standard for modern guitar versatility and muscle. For your consideration, Garrett Park Guitars presents this2015 Fender Mustang III (v2). From the Fender website Ableton® Live Lite 8 Fender Edition studio-quality recording software. Used condition. amp and power cable only. Ready/easy reference source for any Fender Mustang IIIv2 user. However you will need to check that for yourself in the latter four cases before considering buying this guide. I have bought, used and sold an enormous range of stuff over recent years. Speaker: 2x6.5 Fender Special Design. Power: 40W (2x20W stereo). Grille Cloth: Black. 21 amp models. Single channel. Single input. Weight: 17 lb. Covering: Black Textured Vinyl. The Fender Mustang GT Series utilizes USB technology to connect your amp directly to your computer. You are able to send digital audio straight from your amplifier to your Digital Audio Workstation of choice. 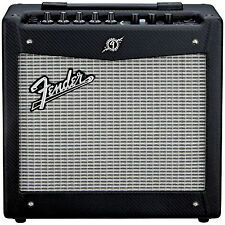 For your consideration is a Fender GT200 Generation Three 2x12 guitar combo amp. Very clean condition, works perfectly. FREE Trial! ARIGATO GOZAIMASU! Japanese products, I can help you! From Hiroshima, Far east island Japan! If you need ASAP! This is a recent manual. NEW - GENUINE FENDER 2-BUTTON FOOTSWITCH. For use on Fender Mustang III, IV, & V Amplifiers. We do not accept wire transfers. Other alphabets (Cyrillic, Japanese, Chinese, etc.) will not be translated and your item will be delayed. MPN: 0080997000. It features a 1/4" jack and 12-foot cable. Used for: Mustang III, Mustang IV, Mustang V Head. Model: Fender 2-Button Programmable Footswitch. A broken string is not considered to be a "defective" product and/or "not as advertised".